Unfortuanetly most pigs don´t have a good live. They are actually often treated really bad. And they are suffering just like humans. They have the conscience of 5 year olds. 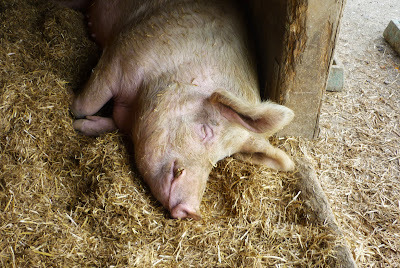 But luckily there are some places, far away from industrial production, where pigs are really happy: Pig Sanctuarys. In places like this they can live just as they like and are treated really good. helping another pig, that was born blind. Happy places like this exist all over the world (altough they could and should be a lot more!). For example in Germany there is Gut Streiflach, a haven for old and endangered animals, where pigs live a happy life. One pig came there for example, because she was a price at a lottery. But the girl who got the pig didn´t know what to do with it, so it came to the sanctuary. Another pig, called Bomber, was living for a long time only in a house. So he was really clean and not used to bath in the mud. That was a problem: the mud usually protects the pigs from the sun. So Bomber always got a sunburn in sunny weather. Therefore the guys from Gut Streiflach had to give him sunscreen. I hope there will be more pig sanctuarys and happy places for pigs in the future! It´s just something we owe these wonderful creatures! 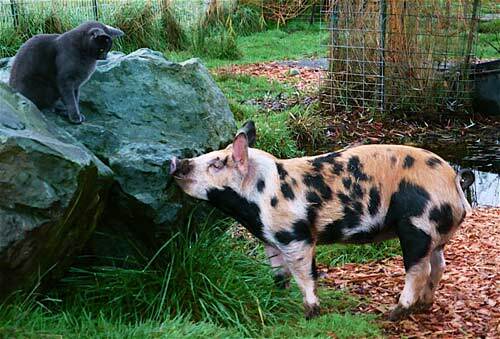 The cat and the pig are good friends. One day, the cat fell into a huge hole, and the pig came to her rescue with some rope, the entire length of which he threw promptly into the hole. The cat cried out, "Now how on earth are you going to pull me up?" The pig replied, "Then what should I do?" The cat said, "Well you should be pulling one end of the rope, of course!" The pig then jumped into the hole, held on to one end of the rope, and said to the cat, "Now we're talking!" The cat began to weep. She wept bitter tears, but they were tears of joy. Some friends are not very smart, but they're worth keeping for life. Die Katze hat eine neue Idee. Sie möchte ihr Tagebuch im Blog veröffentlichen. Aber wenn sie so denkt: Ich muss zuerst essen, dann aufräumen und mich hinlegen. Es gibt nur kurz Zeit bis ich einschlafe. Oh, lieber lasse ich diese Idee unter dem Tisch stehen. Jetzt soll ich wieder ins Bett gehen, so schön, so schön, es hat man schon lange nicht gesehen. Die Augen von Katze sind schon zu. Die Katze war total verwirrt. Sie dachte, dass der Schwein heute bestimmt nicht Zuhause war. Denn er sagte gestern Abend: „Ich möchte morgen nach München fahren um Freunde zu besuchen“, „Vielleicht schaffe ich es auch, meine Papiere abzuholen“. Deshalb hat die Katze mit der Absicht länger gearbeitet und ist nach der Arbeit zum EK Zentrum gefahren. Einerseits wollte sie die Zeit verbringen , anderseits brauchte sie Geld abzuheben . Sie war in einem Laden und hat einen Schal mit Blumen für die Tür im Wintergarten gekauft. Darüber hinaus hat sie eingekauft und ist nach Hause gekommen. Als sie die Schuhe vom Schwein gesehen hat, dachte sie, dass es komisch war, welche andere Schuhe der Schwein getragen hat. Und sie machte die Tür auf und die kleine Lampe, welche als Geschenk von einer Mitbewohnerin geschenkt wurde, war auch an. „Hallo Schwein, bist du schon da? “ Die Katze hatte Überraschung aber war sehr froh, dass der Schwein schon zu Hause war. „Nein, ich bin immer da, ich war gar nicht in München und ich habe dir doch per sms geschrieben.“ sagte Schwein. So peinlich war die Katze. „Wieso habe ich deine SMS anderes verstanden.“, murmelte die Katze. Aber sie wollte nicht das Problem nachhaken sondern fing mit dem Pfannkuchen Essen an. Die Katze war sehr fleißig beim Zimmer Putzen, während der Schwein die ganze Zeit nur auf dem Sofa schlief.